When we consider the nutritional benefits of food, we think about the vitamins, minerals and nutrients they contain. We think about components in the food that nourish the body. Fibre is completely different. The key to understanding fibre’s effect is to realize that the benefit lies not as a nutrient, but as an anti-nutrient. Fibre has the ability to reduce absorption and digestion. Fibre subtracts rather than adds. In the case of sugars and insulin, this is good. Soluble fibre reduces absorption of carbohydrates, which in turn reduces blood glucose and insulin levels. In one study, type 2 diabetic patients were given liquid meals containing 55% carbohydrates with or without the addition of dietary fibre. Fibre reduced both the glucose and the insulin peaks, despite consuming exactly the same amount of carbohydrates. Fibre acts as an anti-nutrient. Because insulin is the main driver of obesity and diabetes, reduction is beneficial. In essence, fibre acts as a sort of ‘antidote’ to the carbohydrate, which, in this analogy, is the ‘poison’. Carbohydrates, even sugar, are not literally poisonous, but comparison is useful to understand the effect of fibre. It is no coincidence that virtually all plant foods, in their natural, unrefined state contains fibre. Mother Nature has pre-packaged the ‘antidote’ with the ‘poison’. Thus, traditional societies may follow diets high in carbohydrate without evidence of obesity or Type 2 Diabetes. The Okinawans, for instance, base their diet upon the sweet potato, and consume an estimated 80% of their calories as carbohydrate. High fibre protects against obesity. Until recently, they were one of the longest-lived peoples on earth. The Kitavans of New Guinea followed a diet estimated to be close to 70% carbohydrate with no evidence of ill health. The one critical difference is that these carbohydrates are all unrefined. The toxicity lies in the processing. Western diets are characterized by one defining feature. It is not the amounts of fat, salt, carbohydrates, or protein that distinguishes the Western diet from all other traditional diets in the world. It is the high levels of processing of foods. Typical Western diets are high in refined carbohydrates. Consider the traditional Asian markets, full of fresh meats and vegetables. Many Asian cultures buy fresh food daily so processing to extend shelf life is neither necessary nor welcome. By contrast, North American supermarkets have middle aisles filled with boxed, processed foods. Several more aisles are dedicated to processed frozen foods. North Americans will buy groceries for weeks or even months at a time. The large volume retailer Costco, for example depends upon this. Fibre and fat are key ingredients removed in the refining process. Fibre is removed to change the texture, and make food taste ‘better’. Natural fats are removed to extend shelf life since fats tend to go rancid with time. 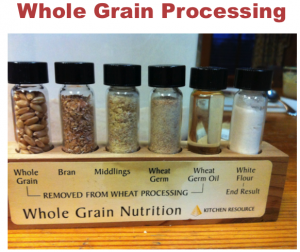 For example, white flour has virtually all the natural fibre and fat removed during processing. This exposes us to the full danger of the naked carbohydrate, which causes the ensuing high insulin levels. The ‘poison’ is ingested without the ‘antidote’. The protective effect of the fibre and fat are removed. Where whole, unprocessed carbohydrates virtually always contain fibre, dietary proteins and fats contain almost no fibre. Our bodies have evolved to digest these foods without the need for fibre. The ‘antidote’ is unnecessary without the poison. Here again, Mother Nature has proven herself to be far wiser than us. Natural foods have a balance of nutrients and fibre that we have evolved over millennia to consume. The problem is not with each specific component of the food, but the overall balance. For example, suppose we bake a cake with a balance of butter, eggs, flour and sugar. Now we decide to remove completely the flour and double the eggs instead. The cake tastes horrible. Eggs are not necessarily bad. Flour is not necessarily good, but the balance is off. The same holds true of carbohydrates. The entire package of unrefined carbohydrates, with fibre, fat, protein and carbohydrate is not necessarily bad. But removing everything except the carbohydrate may destroy the balance and make it harmful to human health. Removing protein and fat may lead to overconsumption. There are natural satiety hormones (Peptide YY, cholecystokinin) that respond to protein and fat. Eating pure carbohydrate does not activate these systems and leads to overconsumption. For example, a glass of orange juice requires 4-5 oranges. It is difficult to eat 4-5 oranges, with all the associated pulp. However, by only drinking the carbohydrate portion, and discarding the rest, you may over-consume that carbohydrate. Another problem arises because the relatively pure carbohydrate results in increased speed of digestion. The rapid rise in blood glucose will result in the rapid rise in insulin. The toxicity lies not in the food, but in the processing. Nutritionism, where foods are considered based on their macronutrient content hid the dangers of refining for many years. Whole grains, vegetables as well as sugar were all considered similar because they happened to all be classified as carbohydrates. But the refined and unrefined carbohydrates were not alike. Both obesity and Type 2 Diabetes are diseases caused by excessive insulin. Insulin resistance develops over time, with persistently high insulin. If fibre can protect against elevated insulin, then it should protect against Type 2 Diabetes. That is exactly what the studies show. The Nurse’s Health Studies 1 and 2 monitored the dietary records of thousands of women over many decades. Overall, the risk of Type 2 Diabetes increases as the glycemic index increases. This is no surprise. 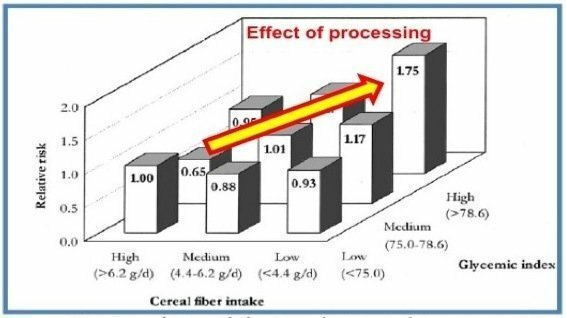 This study was also able to confirm the protective effect of cereal fibre intake. Women who ate a high GI diet but also ate large amounts of cereal fibre are protected against Type 2 Diabetes. In essence, this diet is high in ‘poison’ but also high in ‘antidote’ at the same time. The two cancel each other out with no net effect. Women who ate a low GI diet (low ‘poison’) but also low fibre (low ‘antidote’) was also protected. Again the two cancel each other out. But the deadly combination of a high GI diet (high ‘poison’) and a low level of fibre (low ‘antidote’) increase the risk of Type 2 Diabetes by a horrifying 75%. This is the exact effect of processing carbohydrates – increased glycemic index and decreased fibre. The massive Health Professionals Follow-up studied 42,759 men over 6 years, with essentially the same results. A high GL and fibre diet confers no extra risk of type 2 Diabetes. A Low GL and low fibre diet also has no increased risk. But the diet high in glycemic load (poison) and low in fibre (antidote) increases the risk of disease by 217%. Yikes! The Insulin Resistance Atherosclerosis study confirms that fibre is an important protective factor against insulin resistance. The Black Women’s Health Study demonstrated that a high glycemic index diet was associated with a 23% increased risk of Type 2 Diabetes. A high cereal fibre intake, by contrast was associated with an 18% lower risk of diabetes. One of the key steps in weight loss is the addition of fibre. Even better, do not remove fibre from the natural foods that contain it. The toxicity lies in the processing. Carbohydrates in their natural, whole, unprocessed form, with the exception of honey, always contains fibre. This is precisely why junk food and fast food is so harmful. By its very definition, these are highly processed foods. The processing of foods and addition of chemicals changes the food into a form that our bodies are not evolved to handle. That is exactly why they are toxic. Consider, for example the ingredients in a package of Betty Crocker Super Moist cake, Canada’s #1 selling Cake Mix Brand. In years past, this was a cake that I have cheerfully baked for my own children for birthdays and other celebrations. Is there even a single ingredient that is not processed? Is there even a single ingredient that can be found in nature? The food writer extraordinaire Michael Pollan always has exhorted us to eat Real Food, not “edible food-like substances”. Such amazing wisdom delivered so succinctly. There is one other traditional food that may help protect against elevated insulin and its effects. that fiber is protective in regards to diabetes? I think it needs stronger evidence. 10% reductions leads to the conclusion that fibre reduces insulin. Perhaps you prefer use of the American Diabetes Association diet with NO evidence behind it. You demand evidence for what you do not want to believe, but do not demand it from the conventional diets. You seem to be responding to something you think I said. LOL. I like that. You are correct. Fibre is the ‘antidote’ to the ‘poison’ of carbohydrate. It is not literally a poison, but a good analogy. So, if you do not take the ‘poison’ of carbohydrate, you do not need the antidote. But if you do eat lots of carbs, then yes, you need fibre. Luckily, Mother Nature has already packaged all unprocessed carbs with lots of fibre (with the possible exception of honey). The toxicity, is in the processing out of the fat and fibre. The benefit of fibre is not as a nutrient, but as an anti-nutrient. Just wondering but if honey has been created without the bulk of fibre doesn’t this mean that it is possibly one of the few times that the pure carbohydrate it provides is of benefit for us? I will venture that if you extract the honey as nature intended, in its natural habitat, absolutely, possibly. The 1/4 mile sprint has survival benefits, either little honey, or you burned it off! I understood the body needed fiber to feed your gut bugs. That is not correct? Just wanted to say thanks for these blog posts. They are so informative and look at the subject from all sides. We have had plenty of documentaries here in the UK, which whilst interesting, seem to only skim the surface of the subject. I wonder if you would, one day, be able to post on the subject of weight gain/retention in middle aged women and if there is any specific nutritional advice you could offer in terms of balancing our hormones? Just struggling a little at age 44 to shift the tyre around my mid-section!! 1. Green smoothies – I think that as long as they are relatively low in sugar, they are fine. Fibre is not really destroyed. The problem is really in juicing where the fibre is discarded. Green smoothies are blended. 2. I think it better to eat all at once, rather than space it out. This is due to the issue of meal timing which was covered previously. One caveat with the green smoothies…apparently some have so overdosed on oxalic acid from kale and other green smoothies, they required medical care. Can’t recall if it was due to oxalic acid stones, or something else. But was indeed a result of too much oxalic acid. Something that would be hard to do if one chewed their food, rather than drinking it. Similar to fruit juice in that way, as compared to eating whole fruit. Calcium is a good tool for inactivating oxalic acid – calcium oxalate has a very low solubility in the gut. For those who can stomach dairy, adding milk or cheese to high oxalate foods makes sense. Though processing probably plays an important role, we haven’t seen an RCT showing the difference (in weight & blood markers) between the same amounts/sources of carbohydrates with/without fibre. Absorption might be slower, but it is unclear to me whether that really matters. The epidemiological studies do not show causation and the effect size is sometimes weak (like 18%). Your conclusions that it is all about processing are too early and not yet backed up with enough data I would say. I am probably not in real disagreement with DR. Fung but let me propose an absolute principle for dealing with the disintegrating medical literature: anybody, any researcher, any journalist who reports only relative risk is a con man or worse. Remember, Alice has 50 % more money than Bob but they may both be on welfare. Do you have a post about how to properly diagnose insulin resistance? If not then what are the tests and what are the reference ranges? My understanding is that the most important test is 2 hours post meal insulin test? This is the first thing that goes out of balance? Should the meal be a regular meal or is it supposed to be only 75 g of high glycemic carbs? What are good numbers for this test? I cannot find any good info on that on internet. It seems to be a controversy about it. This is easy. If you have elevated fasting blood sugar in the morning after 8 hours of not eating then you have insulin resistance. Simply love all of the information you provide to all of us lay folks. My husbands T2D is completely reversed and I have lost much needed weight as well. My one vice is red wine. I saw an article that said alcohol raised insulin almost 100%. Tell me that is miss information! Sobbing…. Would adding a little soluble fiber to my beverage help with that effect or does the “food” have to innately be a part of it. Thank you again for all you’ve done. Fiber is not the only goodie in unprocessed foods. It may be very important, but it is not the only goodie. Putting just fiber back into a refined food doesn’t put all of the other goodies back into the refined food. It is just best to not eat or buy refined foods at all. It should be less expensive, but that may not be the case. Would it be beneficial to use psyllium husks or a Metamucil daily? Thank you! I’m curious about Isomaltooligosaccharide, as a sweetener, on a ketogenic diet. Supposedly, it’s just a naturally sweet, prebiotic fiber, which contains no sugar. Is this true? Will use of an Isomaltooligosaccharide syrup or powder, to sweeten coffee, or have on almond flour pancakes spike insulin/blood sugar? Or would something like this be safe to use (in moderation, of course) on LCHF? Just wondering, if I was to eat a bag of sweets but also eat a food high in fiber with it (e.g. an apple or some fiber extract) would this drastically reduce the insulin spike I receive? In essence, I’m asking does the fibre need to be within the food to reduce the insulin spike or does eating fibre with the food have the same affect. Thanks!